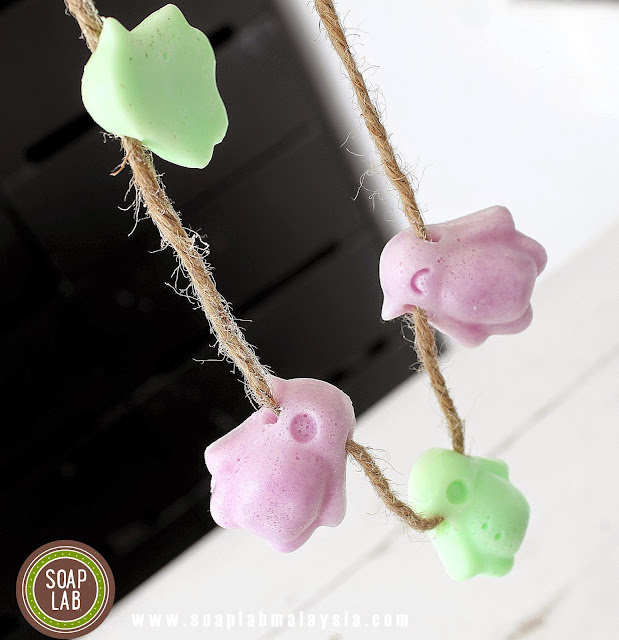 SoapLab Malaysia: Will Baby Cot Insect Repellant melt over time? Will Baby Cot Insect Repellant melt over time? Today i would like to show you one of our favorite post from 2014. This post shows you how to make your own baby cot insect repellant that is safe, and natural, and the best thing; since its made as a solid 'balm' you can apply it on your skin too! Its a solid 'balm' that you can hang on your baby's cot/chair etc. Its made using natural butters and oils so its completely natural and safe. When you hang it; since it has insect repelling essential oil, it will shoo the mosquitos away! Cool right?? Its very easy to make and you can follow this link to see the steps. What i would like to talk about is some concerns people had over the years of making this. Will It Melt after some time? No it wont. The reason it wouldnt melt is in this recipe we are using beeswax and cocoa butter. Both of them are not 'meltable' in our normal temperature. Most of the time beeswax melts at 62 degrees celcius, and cocoa butter melts at 38 degrees celcius. Since you are keeping this repellent in a 'baby room' that will be around 25-29 degrees celcius, it wouldnt melt. However; if you leave it under the hot sun or in the car; then yes it will melt. Can i switch the ingredients? Yes you can but to make it a repelent; we found this combination of essential oil is perfect. But you can change the cocoa butter to shea butter if you wanted the repellent to be harder since shea butter melts at higher temperature of 45 degrees. Can I Apply This Directly On My Babe? No. You shouldnt apply this on babies below 1 year old. Heres an article i wrote about the danger of essential oil when applied on babies so do check that out:-) But yes you can apply it on yourself! Can I Use The Same Recipe and Make Crayons? Yes you can. Infact we have a crayon recipe too here. Just omit the essential oils and add more colors!